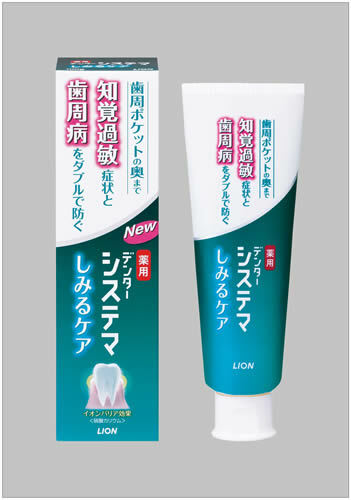 Lion Corporation (President: Itsuo Hama) announced today the nationwide release on Wednesday, October 3, 2012 of Dentor Systema Toothpaste Sensitive Care. The latest addition to the Dentor Systema brand—which offers solid periodontal disease prevention—this medicated toothpaste helps guard against the stinging pain caused by hypersensitivity as well as periodontal disease. 1.Periodontal disease is the general term for a group of diseases that include gingivitis and periodontitis. A 2011 survey on dental diseases conducted by the Japanese Ministry of Health, Labour and Welfare revealed that approximately 80% of adults2 currently suffer from periodontal disease. According to a recent Lion survey, about 20% of such adults also suffer from hypersensitivity. Accordingly, there is a need for toothpaste that can help prevent both stinging pain and periodontal disease. Hypersensitivity is caused by the exposure of dentin deep inside the periodontal pocket. This is due to receding gums resulting mainly from periodontal disease. As such, there is a scientifically proven relationship between hypersensitivity and periodontal disease. On this occasion, Lion Corporation will release Dentor Systema Toothpaste Sensitive Care under the Dentor Systema brand, which offers solid periodontal disease prevention thanks to the use of Lion’s advanced periodontal pocket care technologies. Accordingly, Dentor Systema Toothpaste Sensitive Care helps to effectively prevent periodontal disease while guarding against the stinging pain caused by hypersensitivity. (1) The “ion barrier effect” helps prevent hypersensitivity. The “ion barrier effect” of the medicated ingredient potassium nitrate guards against the discomfort and pain caused by sensitive teeth. As periodontal disease progresses, dentin deep inside the periodontal pocket is exposed. The exposed nerves become sensitive to irritants, causing a painful stinging sensation. The medicated ingredient potassium nitrate breaks down into potassium ions that create an “ion barrier effect” around nerves and, in turn, protects them from being irritated. (2) The actions of Lion’s periodontal pocket care technologies and an anti-inflammatory component help prevent periodontal disease. Lion’s periodontal pocket care technologies feature an antibacterial mechanism that penetrates biofilm as well as a bacterial adhesion blocking mechanism. Antibacterial mechanism: Isopropyl methylphenol (IPMP) penetrates the biofilm hidden deep in the periodontal pocket to kill bacteria. The anti-inflammatory component ε-aminocaproic acid curbs inflammation of the gums. (3) Sodium fluoride strengthens tooth structure to help prevent cavities.